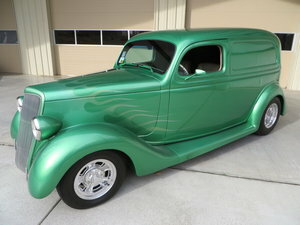 1937 Ford Sedan Delivery Street Rod Ground-up build w/Fatman frame, Mustang II front end; Weedetr rear suspension. Fuel injected Tune-Port 350 engine & 700R4 O.D. Transmission, and Ford 8\' rear-end. Griffin alum. radiator, Classic gauges, tilt column, Tea Seat; matching cloth interior, power windows, remote door openers, A/C, and many other features. Please Note The Following **Vehicle Location is at our clients home and Not In Cadillac, Michigan. **We do have a showroom with about 25 cars that is by appointment only **Please Call First and talk to one of our reps at 231-468-2809 EXT 1 ** FREE Consignment Visit Our Site Today Easy To List Your Vehicle and Get it Sold in Record Time.